AIR FARES are not included. All entry fees and camera fees at the monuments and attractions. Personal expenses such a Mineral water, drinks, porter ages phone calls, laundry charges tipping etc. Any Taxi fares to market. Any other service requested separately during the course of the tour for any reason. Any service not specified in the inclusions. In the Morning/Afternoon and transfer to respective hotel and rest. 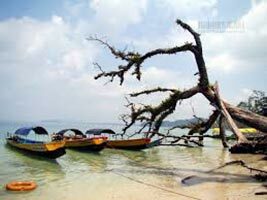 In the afternoon proceed for the Corbyns Cove Beach - 7 kms from Port Blair - a coconut palm fringed beach, ideal for swimming, sun-basking & bathing. Late evening witness the enthralling Sound and Light Show at Cellular Jail - where the heroic saga of the Indian freedom struggle is brought alive. Overnight stay at respective Hotel / Resort at Port Blair. After breakfast, start for a half- day excursion to Ross Island, the former residential and administrative island of the British during their rule of South East Asia, was nick named the Paris of the East. This island was completely destroyed in an earthquake, now in ruins. After Lunch, we travel to Chidiya Tapu Beach for Sunset Point. Night @ Hotel. 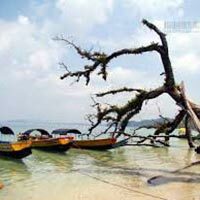 After Breakfast, departure by M.V.MAKRUZZ(CATAMARAN LUXURY FERRY) to Havelock Island (54 kms by sea from Port Blair).Enjoy your afternoon at the World Famous Radhanagar Beach (Beach number 7).Overnight stay at respective Hotel/Resort at Havelock island. After Breakfast, we proceed for Elephanta Beach. Then After Lunch Sail for Port Blair in the Evening. Upon return from Havelock Island, by same Cruise, transfer to Hotel. Overnight stay at respective Hotel / Resort at Port Blair. At early morning (08:00hrs) proceed for full day trip to JOLLY BUOY / RED SKIN, is a part of Mahatma Gandhi Marine National Park, Wandoor has a nice beach and offers spectacular view of corals, fishes and marine life. An island in Mahatma Gandhi Marine National Park, it offers a breath taking underwater view of coral and marine life. It is an ideal place for snorkeling, sea bathing and basking on the sun kissed beach. Early Morning visit to Baratang Island a journey through the evergreen forest for enjoying Creek Safari and Lime stone cave, After Lunch we Proceed to Ama Kunj Beach in Rangat. Overnight in Rangat. Early Morning visit to Diglipur Island, Then take a Breakfast And we proceed to Ross Smith Island. After Lunch Proceeding to Kalipur Beach. Overnight in Diglipur. Early Morning After Breakfast visit to Ramnagar Beach, Then Depart for Karmatang Beach in Maya Bunder. Overnight in Maya Bunder. After Breakfast Check-Out The Rooms, And then Back to Port Blair. Overnight in Port Blair. After Breakfast, we proceed for Mount Harriet, the highest peak in the South Andaman’s (365 meters high). During British Raj this highest peak was established as the summer headquarters of the Chief Commissioner during, this place is an ideal for a nice and fascinating over view of the outer islands and the sea. Evening Free for Shopping. And Overnight in Hotel. Morning After Breakfast, the program for City Tour begins with the sightseeing tour in and around the city like cellular jail, Naval Marine Museum (Samudrika) -gives a good retrospect of the history, shells, Corals marine life, geography and archaeology of these islands, Chatham Saw Mill - one of the oldest and largest wood mill in Asia, Forest museum - offers an insight into forest activities through scale models and displays decorative pieces made of famous woods, Anthropological Museum - displays tribal essential and artifacts, Science center, Fisheries Museum (Aquarium) - exhibits species of marine life peculiar to the islands & Cellular Jail and Shopping. Overnight in Hotel. Dropping to Airport with memories and terrific holidays at Andaman Islands.